Home > Hot & Cold Climates > Questionnaire: How Safe Are You in the Sun? Most people like to take their summer holidays someplace where they can find a little sun, but sometimes enthusiasm overcomes common sense and a bad case of sunburn or heatstroke follows. Unfortunately, too much time in the sun can also lead to longer term health complications like pre-mature aging of the skin and even skin cancer. But the good news is that by following proper sun safety precautions you can easily cut down your risk of any sun-related complications. To help you determine if your sun safety knowledge is optimal for a healthy holiday we've put together the questionnaire below. Simply answer "yes" or "no" to each question and then total your answers to find out how safe you are in the sun. 1. Do you wear sunscreen each and every time you go outside? 2. Do you use a sunscreen that contains both UVA and UVB protection, with an SPF of at least 15? 3. 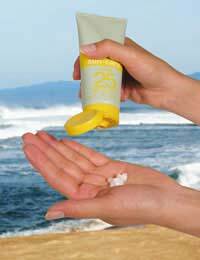 Do you reapply your sunscreen frequently, particularly after swimming? 4. Do you use sunscreen on often forgotten areas like your ears and the parting in your hair? 5. Have you asked your doctor or pharmacist if any of your medications make you more susceptible to sun? 6. Do you avoid physical activity outdoors between the hours of 10am and 4pm? 7. Do you wear a hat in the sun to protect the delicate skin of your scalp and face? 8. Do you wear UVA and UVB blocking sunglasses to protect your eyes from sun damage? 9. Do you seek shade when you feel tired, dizzy, confused, have a headache and/or upset stomach? 10. Do you continuously drink water when you are in the sun? 11. Do you wear protective clothing when you are in the sun? 12. Would you seek medical help for a sunburn involving a lot of blisters, pus, high fever and/or chills? How Safe Are You In the Sun? If you answered "yes" to between one and four questions then you are not very safe in the sun. Your skin remembers each and every time it is exposed to the sun, so if you haven't been practising sun safety then you should do a thorough check for sun damage - involving a medical professional if needed. Before your next holiday load up on sunscreen and don't forget to apply it frequently. In fact, save a bottle for everyday use as well. You can get some sun just by walking around town, so don't forget to apply a layer or two while your out. For more information on proper sun safety consult your GP, a dermatologist or the NHS. If you answered "yes" to between five and eight questions then you are somewhat safe in the sun. You seem to know the basics of sun safety, but whether or not you practice it is another matter. Don't expect to get lucky and escape the consequences of too much sun. You may think a tan looks nice, but in fact it's an early indication that the sun is affecting your skin. Bring sunscreen and protective clothing when you are out in the sun, and try to avoid too much physical activity in the middle of the day. Stay well hydrated, and if you do have a problem don't hesitate to seek medical health - bad sunburns and heatstroke are both serious matters. If you answered "yes" to nine or more questions then you are usually safe in the sun. You understand the risks of too much sun and you know how to protect yourself from sun damage. Just make sure that you take precautions every time you are outside, even if it looks cloudy or is cold. It is estimated that 80% of UV rays can travel through clouds, fog and haze so don't take any chances. Educate others who travel with you as well, so you aren't stuck helping them through sunburn or heatstroke instead of enjoying your trip.